It’s a sad fact that instances of lead theft have risen due to the price of copper and lead increasing in line with demand from China. The price of lead has risen to record prices, which has led churches, schools, public buildings and charities facing major roofing costs – often tens of thousands of pounds worth – and damage from flooding thanks to the roof damage created by unscrupulous lead thieves. Many buildings have lead flashings or tiles and when this is disturbed, the building is vulnerable to weather conditions. Sometimes it’s difficult to stop lead theft. Bar sitting and keeping a vigil all night to spot the thieves in the act, it can be tricky to prevent lead thieves from accessing your roof. Isolated churches make the ideal target for would-be lead thieves, but no property is safe from determined criminal gangs who are armed with equipment to access your roof and deprive you of the lead work. As well as the cost of repairs, many property owners are faced with meeting the costs of replacing roof lead themselves because their insurance policy may not cover theft if there has not been a forcible break-in to your property. If there’s thousands of pounds worth of lead sitting on your rooftop, it might be worth checking with your insurer to see what would be covered. In the meantime, you can take some steps to help prevent lead theft. Lead theft activity is usually at its peak during holidays, when public buildings may be closed, and during the summertime when the weather is fine so be extra vigilant at these times. To help deter the lead thieves, you could try installing CCTV. This is an expensive option, but will allow you to monitor your building at all times so if the worst did happen you may be able to trace the thieves. Make sure that your premises are secure – if you have gates, keep them locked at night. Lighting can also deter the lead thieves, so choose security lighting that will illuminate your property when an intruder comes too close. You can also purchase security alarms for your rooftop as well as the interior of your property. Be sure to keep items such as wheelie bins out of the way, which could be used by the lead thieves to gain access to your roof. The same rule applies to tall trees around the building with overhanging branches that could provide the perfect access to your rooftop. There are a number of anti-climb paints you can purchase that will make it very difficult for lead thieves to climb up to the roof. You can apply these paints to drain pipes and guttering to restrict access. Keep your ladders locked up tightly and do the same with wheelbarrows, which could also give your lead thieves a helping hand. 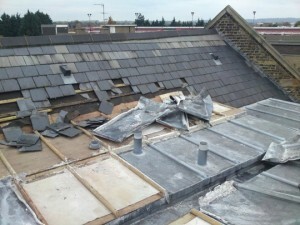 This entry was posted in How To Roofing Blogs and tagged How, lead, metal, on, prevent, theft, tips, to. Bookmark the permalink.